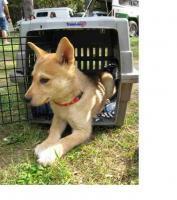 Breeders In Canada, And Hard To Crate Train? Hello, is it true that it is hard to crate train AID's, and that it is bettert to paper train them (dogbreedinfo.com) and also, are there and breeders in Canada? i have not crate trained so i can't say from personal experience. i have talked to other owners who have and it didn't sound any harder than any other dog. and no, there are no breeders in canada. go to the link on the home page for song dog kennels. are you in canada ? A tree born crooked will never grow straight. T.W. I crate trained my AID, it was tough at first but I stuck with it and now she sees her crate as a nice little hideaway when she wants to be left alone. I reccomend it if you want to keep a dog in the house, or want to take it with you out in public (mine will sometimes seek out a place under a desk or table). I didn't paper train her, just kept taking her outside and she got the idea pretty quick (with a few accidents). i think corrine is from canada. alberta ? is that right corrine ???? Some of our dogs like crates, and some don't--like most breeds. I don't recommend paper training.....they house train quickly, and paper training just confuses the issue. My dog can hold it for an incredibly long time. We think he must be three quarters bladder. Yes James... I AM Canadian!!! I am in Calgary, Alberta. We had no problems crate training Jake Gordon. In my opinion, crate training is the best way to house train and keep them out of trouble when unsupervised. I would say I had Jake house trained in ~2 weeks. The important thing is to NOT open the crate when they are whining. You must wait until the dog is quiet. We did not leave Jake for more than 2 hours at a time at first. During the night, Jake was fine until morning at about 12 weeks, but we regulated his water intake in the evening. We have a day use crate in the kitchen and one in our bedroom for at night. I think this is important. Apparently, it is a privledge for a dog to sleep with the Alfa in their den. I had read that 70% of dogs who were confined to the garage or another area in the house developed behavorial issues! Now, I have no idea if this is true, but we are fine with this. Some people have experienced whining espeically at night. I would recommend reading the Monk's of Newskeet on this issue for some very helpful information. I also made the crate very comfortable... I gave him safe toys and treats to keep in there (but not at night). I also gave him tones of praise when he went into the crate on his own. We still use the crate, but you must use caution... make sure your dog is tired if you are going to leave them for an extended period of time after 6 months of age. Jake is now 6 months old and we will not leave him for more than 5 hours in the crate. Anymore questions, feel free to email. Here's the link for the Monks. I read their puppy book, it was pretty helpful. Also, the monks now have a show on Animal Planet (Mondays at 8 PM). It's only 30 minutes, but you can pick up a few good tips. Here is the best answer I can give to your question, "Are Indian Dogs hard to crate train?" thats a really pretty dog, who is it ?? I'll be posting more pics of this pup, inside. This was one of the calmest pups I've ever seen. His pal, who also picnicked with us, was a wiggly one--hard to get a picture of. Still, after he wore himself out, he went into the crate, took a quick rest, and then ran all over the place, again. Really nice dogs.